Know where you're headed before you walk down the aisle. 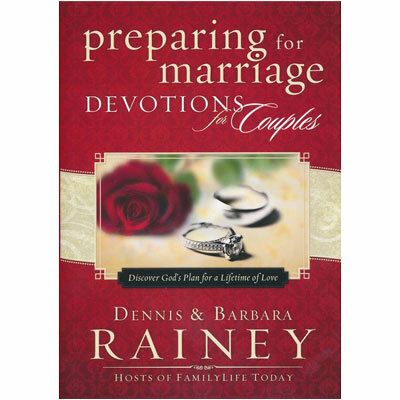 This companion devotional to Dennis and Barbara Rainey's Preparing for Marriage book offers 42 short devotionals written by the authors that help couples lay the foundation for a strong marriage. Get ready for the day after the wedding day by spending quality time with God and each other today! Dennis Rainey is a best-selling author, dynamic speaker, and cofounder of FamilyLife®, a ministry of Cru®. Under his leadership, FamilyLife grew to help marriages and families survive and thrive in more than 109 countries. Together he and his wife, Barbara, have spoken at over 150 FamilyLife Weekend to Remember® marriage getaways and authored or co-authored more than 35 books, including best-selling Moments Together for Couples and Staying Close. He is also the original daily host of the three-time award-winning radio program FamilyLife Today®. He and Barbara have been married since 1972 and love laughing with their six children and growing number of grandchildren. The Raineys still serve with Cru. You can follow their work at DennisAndBarbara.com. Barbara Rainey is a best-selling author and cofounder of FamilyLife®, a ministry of Cru®. Together, Barbara and husband Dennis have spoken at over 150 FamilyLife Weekend to Remember® marriage getaways and authored or co-authored more than 35 books, including best-selling Moments Together for Couples, Staying Close, and her most recent, Letters to My Daughters: The Art of Being a Wife. Since her Ever Thine Home® product launch in 2011, Barbara has been helping families intentionally express their faith beautifully in their homes. She and Dennis have been married since 1972 and love laughing with their six children and growing number of grandchildren. They still serve with Cru and can be followed at DennisAndBarbara.com.